Josh Groban is popularly viewed as an operatic (or quasi-operatic, anyway) singer, but that has little to do with his material; for the most part, that is typical coolness-be-damned adult contemporary pop, with a few romance-language numbers. And despite the too-prominent orchestra, it usually does not characterize his arrangements. It is Grobans vocal approach, which refuses to place beauty secondary to emotional truth like pop music and doesnt rely on expressing internal emotion like musical theater. Instead, Groban delivers his melodies cleanly and unambiguously, albeit filtered through heavy vibrato and a slight nasality. Monday night at TD Garden, he did exactly that for nearly two hours, often proving himself less a singer than a vocalist in the process. Songs that cried out for earthiness, like the Latin-tinged Un Alma Más, were left wanting, and the immense charm and wit he showed when simply talking to the audience seemed to vanish once the music started. Grobans duet with opening act Judith Hill on The Prayer laid that bare. 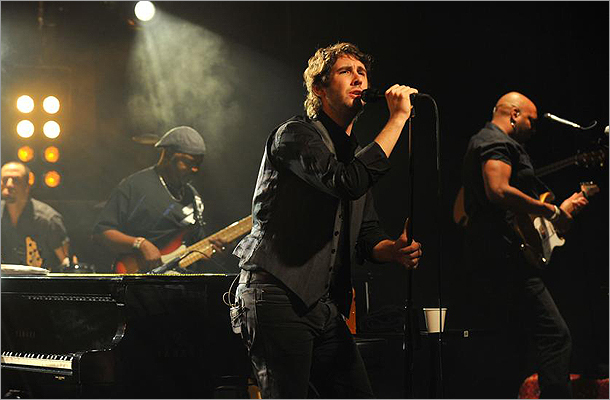 Her first verse began the song with emotive pop vocals before he joined her with his warbly croon, and the contrast between the two styles revealed Grobans habit of running roughshod over the concept of interpretive singing. Whatever the symphonic Celtic folk of She Moved Through The Fair conveyed came from the words and the tune themselves. Groban let them do the work and stayed largely out of their way. Sometimes it was enough. There was a genuine power in the way that the chorus of Alla Luce Del Sole, with its sweeping electric guitar and anthemic drum hits, galvanized the song, and Remember When It Rained similarly worked best when it succumbed to electric bombast on the coda. Near the end, with the accumulated weight of the concert behind it, Stevie Wonders I Believe (When I Fall in Love It Will Be Forever) was a fittingly overwhelming vow of romantic certainty. But Groban was not overwhelmed. In fitting with her reality-show pedigree, The Voice contestant Hill opened with a solo-piano medley of staples Feeling Good, Ill Be There, and Youve Got A Friend before moving on to her own soulful material. From "Candle in the Wind" to "Benny and the Jets," Elton John has been serving up big piano-based hits for decades. Enter to win your chance to score a pair of tickets to see Sir Elton live at the TD Bank Garden on November 12 by submitting your information below. Winners will also receive an iPod loaded with his music. For complete contest rules, click here.